The last couple weeks I think I’ve done a pretty good job of being kind to myself and honoring my desire to slow down. If you’re not sure what I’m talking about you can read last week’s note by clicking here. This week the tide is turning. My inner voice is telling me it’s time to start moving out of my cozy cocoon a bit and move closer to the groove that I had in early December. Now, this doesn’t mean that I’m not taking care of my self or jumping into DO-ALL-THE-THINGS mode. I know myself well enough to know that’s NOT going to work for me. This will be a slower process. And my new groove might look different than it did last year. One of the things that fell by the wayside the last few weeks was my morning routine. It wasn’t perfect, but it did mostly work for me. I say mostly because toward the end of the year I was thinking about how to tweak it to support me more. Since that morning routine has mostly disappeared, this is a great time for me to think about what I want my new routine to look like, implement it, and tweak it as much as necessary. Maybe January came and something you were doing EVERY morning fell by the wayside or was replaced by something else? Or maybe you had some resolutions and changed A BUNCH of things at once and ALL those changes aren’t sticking (according to some studies right about now is when most people are abandoning their New Year Resolutions, although some studies put it at the second week of February). If you’re trying to make a lot of other changes in your life or business right now, maybe pick one thing to add or remove from your morning routine. If your morning routine has devolved into something that’s just not working at all (mine worked very well for taking it easy, but it’s not working so well for getting into my office when I want to in the morning), then it might be time for an overhaul. This is a great time to take a step back and look at how your morning routine is working for you and decide what, if anything, needs to change with it. And if you want a second pair of eyes or someone to help you with what changes you might want to make, reach out (add a comment below) and we can get something on the calendar. What are your gut feelings about what you should be focusing on or doing this week, month or quarter? Have you taken any time for yourself (real time for yourself) to notice? I’ve noticed a desire to slow down right now. Saturday was the funeral for my father-in-law and it was a beautiful time of remembrance of his life. People keep asking how I am and I respond with “good” and “fine”. I respond this way not because I want them to feel better, but because I really am good and fine. I’ve noticed part of me thinking that because I am “good” and “fine” I should jump right into “normal” life. My head keeps telling me to do more things, update my plan for the first quarter with ideas I’ve had in the last 10 days, and put solid dates and plans into the calendar for 2019. And yet, I’ve felt the desire to slow down. The desire to slow down comes from a deeper place. From this deeper place, I’m being asked to put a hold on the PLANS I want to create now because they’ll change in a week or two. From this deeper place, I’m being asked to recognize that even though I really do feel good and fine, I need some time before I jump back in 100%. From this deeper place, I trust that taking this time now will serve me better than PUSHING through and DOING-ALL-THE-THINGS. There won’t be a Wednesday LIVE with Evie this week and it may not return until February. However, I’ll still be showing up here each week with a note like this one. And while today’s note isn’t an overt productivity tip, it is a productivity reminder to listen to your intuition and notice what you need. YOU are the driving force of your business and taking the time to notice and honor what you need is important. What guidance does your intuition (or gut or whatever your name for it is) have to share with you about the upcoming weeks? If you would like to share I’d love to see your responses in the comments below! There’s been a bit going on behind the scenes that have contributed to my silence in the last week or two. Yes, part of it was the holiday season and spending time with family. The other part is that my father-in-law, Phillip, passed away the weekend before Christmas. His funeral is this weekend. There is no Wednesday LIVE with Evie this week and while I’ll be working, there might not be one next week (we’ll see how things go). There are two thoughts about what to do with your business when things like this happen (whether expected or unexpected). One is to PUSH through it. 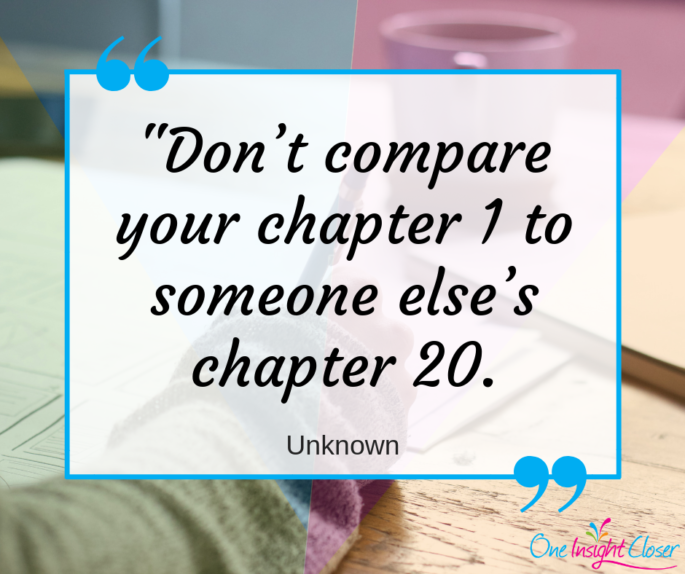 Show up in your business despite what’s going on behind the scenes. Because the world won’t wait for you! Don’t feel like it? Pressed for time? TOO BAD! You have a business, so GET TO WORK! The other is to take the time you need (within reason) and take care of yourself. Yes, you might lose some momentum. Yes, there are things to be done that aren’t getting done in your business. But taking care of yourself and your loved ones is also important. Here’s quick story relating to this. Many years ago I went to an all-day business training hosted by a successful relationship coach. She was teaching how she built her successful coaching business and how you too could have a successful business. I don’t remember the question that someone asked about halfway through the day, but I STILL remember her response. She started ranting about how everyone has to do things in their business even when they don’t feel like it. She went on to share, still ranting and angry, that her serious boyfriend (she had thought he was going to propose soon) just broke up with her and SHE didn’t FEEL like doing this training, but she was HERE ANYWAY. She was very upset and angry and basically yelled at the woman who asked the question. It also made a couple other…interesting…things from the day make more sense. If she would have taken the time SHE needed, despite the inconvenience to everyone else, I think everyone’s experience that day would have been better. The problem with PUSHING through it is we don’t give ourselves times to process the things that are happening. And if you don’t give yourself time and space to process, those feelings will find other ways to be expressed (like the story above). So, while you might lose some momentum and you might not complete the things you planned to get done–it’s okay. YOU are more important and those things can be done later. I don’t post on it, but I do use it to follow some people and occasionally I’ll check it in the morning. This type of advice annoys me because it looks like it’s proven, but it’s not. There is a correlation (like how people wear more short sleeves than sweaters when buying ice cream cones), but there isn’t causation (like how when the weather gets warmer ice cream cone sales increase). Yay! A successful person who thinks this advice isn’t helpful! Here’s the thing: not everyone works the same way! There is no ONE thing that will guarantee success. 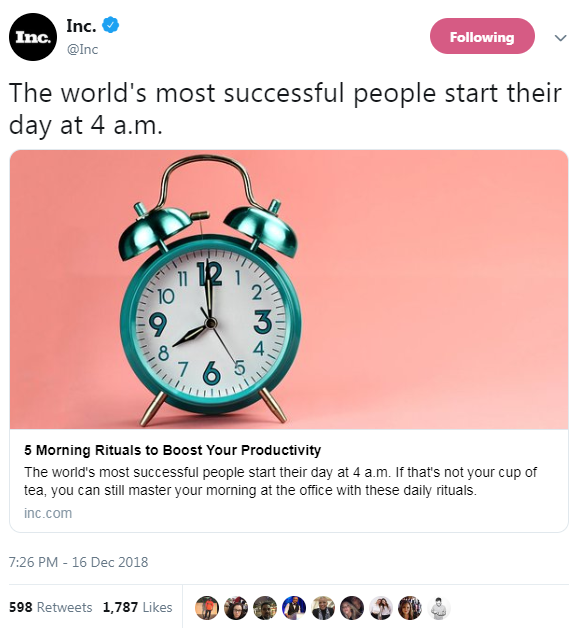 Getting up at 4 am works for those successful people because they’ve found something that works for them and they stick to it. THAT’s the important part–finding something that works for you and keep doing it. In this week’s Wednesday LIVE with Evie we’ll talk about this.